A card game created according to the principle “print-n-play”. All materials (cards, game rules, description, small playing cube) are presented in an electronic form, they are to be printed and then you can start playing. It is convenient – you need not buy anything for starting this game. Any number of players may participate in the game. All is defined by the number of cards and the size of a playing field. A score is kept during the game. All materials are included in a ZIP archive. The archive contains files in the following formats: .doc .pdf and .cdr Pdf is opened by Adobe Reader program, doc – by MS Word editor, cdr – by Corel Draw 11 program. You might have participated in such games, in which you move blocks along an artful road depending on the number of points shown on a playing cube thrown. You might have participated in card games. 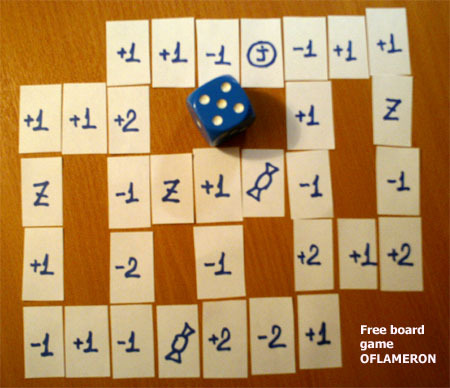 A card version of this game “OFLAMERON” resembles somehow both games – You should move your blocks (markers) along a road made of playing cards, depending on the number of points shown on a small playing cube thrown. During the game, you will have to estimate income and losses after each step and plan your strategy for achieving the maximal success. A specific feature of a card version of this game is the fact that cards are placed in one line along the perimeter of a rectangular (in the simplest version), for example, along the perimeter of a table. The correlation of sides of a rectangular, a number of cards may be any (it is defined by the players themselves). In this game, a usual small playing cube with the value of 1-…-3 or 1-…-6 is used. 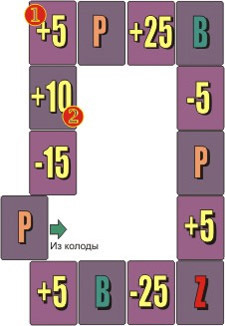 After cards are placed, each player should place its marker on one of the cards (with which the game and the player’s score start). The marker is any block – a coin, a button, etc. It is understood that it is worth choosing a card of the biggest face value at the beginning of the game. As this example shows, it will be the card [T]. [1,5,10,15,25] - when a marker falls on these cards, the specified number of points (1, 5, 10, 15, 25) is added to the player’s score. [END] - end of the game. If a marker of any player is placed on that card, the game is ended. The game may be finished, when a marker of any player is placed on the card (END) or when a player has the score more than it is specified beforehand. When the players start the game Oflameron, they may place all their markers on the same card. It is not possible to have a negative score in the game. If the score of a player is negative, the game Oflameron is over. The player having the biggest score wins. According to the example in the picture, the face value of the card [T] is equal to 500. That is why each player adds 500 points to its score. Now the players should throw a small playing cube. For example, the first player has the value of 3 shown on a small cube thrown. The moving is permitted only clockwise. 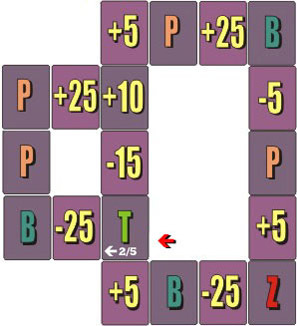 The second player makes the same turns. 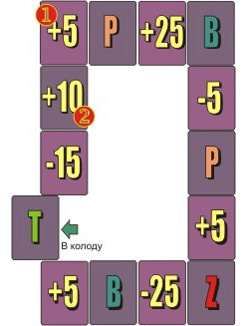 After the player (if there is only one marker on the card) or players (if there are some markers on the card) moved their markers to new places, the face values of the cards, on which the markers were moved, are added to the score and the former cards are removed from the table into the pack and instead of them new cards are added from the pack (i.e. there is rotation of cards, and if the playing field looks like a rectangular ring – see pic. – the game is not repeated, as cards are changed). The card from which markers (blocks) were removed, is placed to the pack. Instead of it, a new card is placed from the pack. Thus, if there is not at first the card [End] in a playing field, it may be added during the game. As the markers may go along the card road several times, a change of cards involves a significant number of chances in the game. Etc. The players throw a small cube once more, move markers, add points to their score, replace cards, throw a small cube, … The game goes on until a marker of any player is placed on the card [End]. 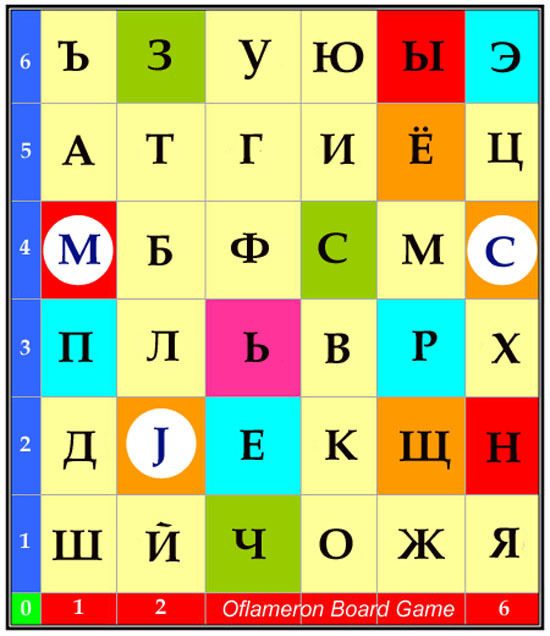 If the player has more than 500 points of its score, such player may obtain (500 points of its score are diminished) and place another marker on any card in a playing field (total number of markers is not limited or is specified before the game starts). What does it result in? Values of a small cube thrown may be shown in such a way that the movement of a marker results in zeroing of the score or its negative value. During the game, the player may move only one of its markers in a playing field every time it throws a small cube – and may choose the marker, which it is better for him to move. There is a version of the game, in which markers are not moved along the road but playing cards are only moved. But that is not all, now it is the most interesting. The game does not go on “in a circle”. 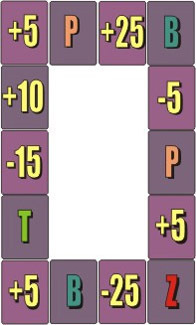 Some cards have arrows, which may significantly change the course of the game creating crossroads. If a marker of any player falls on a card having arrows than it is necessary to estimate the number of points shown on a small cube thrown and after that to move such marker in the corresponding direction (i.e. the road of cards may include forks, side turns, crossroads, and have a very complicated scheme). If the players did not make the relevant “fork” of playing cards, then such card is deemed to be simple without an arrow. If you need not any forks in the game, then you can unpack playing cards without additional arrows. 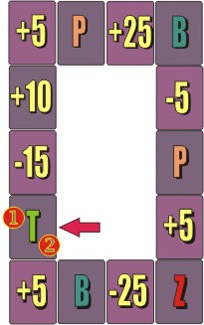 If the player’s marker falls on this card, and 2 or 4 points are shown on a small cube thrown (the card has figures (2) and (4) indicated), then the marker is to be moved to the following card according to the arrow. If the players have other values on a small cube (1, 3, 5 or 6), then it is played as with a usual card. Now, if 2 or 5 points are shown on a small cube thrown, and after moving the marker is on card (T) (marked with a small red arrow), then the player will make the next turn to the left (where a white arrow on card (T) indicates). 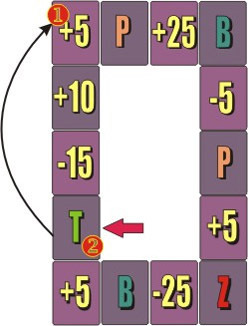 In this case, the card (T) is counted as the player’s points and then the player moves its marker along a small ring (of this playing field), etc. There may be any number of such forks on the route (Just add more cards into the pack. The size of the pack is not limited). The playing field may cover as the entire table as the entire floor in a room! The game "OFLAMERON" is outstanding by the fact that once you make unusual and beautiful playing cards, you may choose a version of the great number of playing versions. Vector images developed in Corel Draw allow to make qualitative playing cards. It is quite simple to download the file containing images of playing cards, to load it into Corel Draw and print the required quantity of cards by a color printer. The playing cards of the super category may be purchased, when ordered at a printing shop according to the Digital Print technology. In these purposes, you can use available vector images of cards in Corel Draw or Word format. The design of playing cards is specifically developed to be printed by a black-and-white printer with the perfect quality. Use the high quality thick paper and printer setups for qualitative art printing. If it is possible to make cards hard and waterproof (for example, to laminate), do it and they will serve you longer. As the author does not restrict the use of this game and playing cards, then you may use it as you wish. For example, during your vocation this game will allow you to occupy your children and you will have some spare time. In this case, you can even use the cards made of materials at hand. You will need only paper, scissors, a felt tip pen and a small playing cube! Now only a part of the information about table card games is set forth. There is a great deal of sites devoted to the game “Oflameron” describing other versions of the card game “Oflameron”, versions of the game “Oflameron” on a sheet of paper containing the game listing on Visual Basic, Delphi and Java. If you like this game, you may place its archive on your web site.